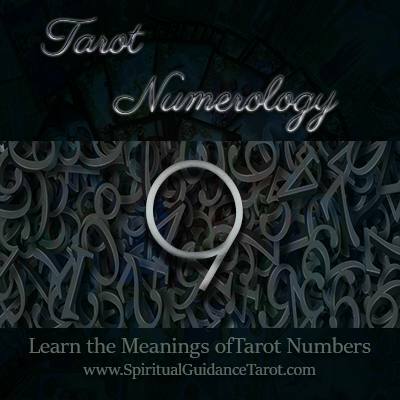 The Nine in Tarot is a number of higher vision and purpose. It symbolizes the process of both endings and new beginnings, taking the benefits, lessons and positives from the past as you move forward towards a new beginning. The Nine speaks of moving beyond one’s limitations and into new areas of potential, contemplating and pursuing new avenues of fulfillment. People with the number nine prevalent tend to be very compassionate, humanitarian people who have higher vision and are your more “dreamy idealists”. Well balanced 9’s are compassionate and visionary, they can do practical work, but still have a visionary aspect that inspires others. Unbalanced 9’s tend to be those who play the martyr, or who are always focusing on negativity and victimization. They are wounded idealists who struggle sometimes to accept themselves and others. In time, they may build up a lot of resentment and often feel misunderstood. Multiple nine’s in a reading may be telling you it’s time to move beyond what you think is possible, to tap into that inner visionary and look for better opportunities. Glean what you can from where you have been, but open up your mind and heart to new ideas and fresh starts. Strengths of the Nine: Visionary, Adaptable, Embraces fresh starts, learns from the past, able to move on and let go. Challenges of the Nine: Disappointment, pessimism when things don’t go as they’d hoped, feeling misunderstood, being a victim rather than empowered.